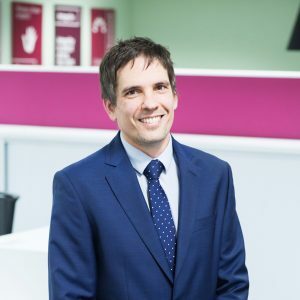 Mark is an Associate Solicitor at CFG Law and a true advocate of our ethos to always provide outstanding client care and ensure early access to treatment, rehabilitation and support. He understands the value of getting access to this support at a very early stage to achieve the best possible recovery and outcomes for his clients. Mark’s entire career in personal injury law has been in representing claimants and he has always been on the side of the injured person, fighting for access to justice and compensation on their behalf. Mark has a very compassionate nature and always endeavours to ensure his clients feel at ease discussing their injuries with him. He has the expertise, imagination and negotiating skills to get you well across the line and on the road to recovery. Approaching every case with thoroughness and an attention to detail. Highly experienced in understanding both the litigation process and identifying clients’ needs. Describing the entire process in understandable and simple terms for his clients. Making a difference to his clients’ futures in securing early treatment, support and compensation that truly meets their needs. Working with other highly experienced solicitors in a compassionate firm. The varied nature of circumstances, injuries and medical evidence that arise in cases. The complex nature of different injuries sustained by his clients (including tetraplegia, brain injury, psychiatric injury, orthopaedic injury and chronic pain). New investigative options for diagnosing brain injury in cases of “subtle” traumatic brain injury. “Thank you for coming into our lives during our time of need. The advice and help you have given have been invaluable.” G.R. “We have no words for how much we appreciate the support you guys gave us when we needed it most. We’re extremely grateful for the patience and help of Mark Ellis, for your support and guidance – we couldn’t have wished for a better team to get us through and we are eternally grateful to you.” S.J.